For hi end projects this amp may also be used for mid-range or tweeter amplifiers in bi/tri amplifier systems. First of all, lets have a description of what the TDA1514 single chip amplifier is like. Well its a single 9-pin chip that provides holes on either side for mounting onto a heatsink. It doesn't really require many more additional components and all of those are easily available. The design I used was for s split rail power supply and these are suggested as they are probably easier to build and provide a good PSU base so long as the rest of the amplifier circuitry is also split rail. And from what I can tell, it has much better overall sound then TDA2040 chips (and the like). Up to 50W of power! If you are building this amp for lower powered applications (it will run on PSU's right down to +/-10V), then this chip will drop straight into a stripboard PCB with no awkward bending of pins and such, and other components should be accommodated with ease. I wouldn't recommend stripboard when powering this amp at over +/- 17V (from a 12V transformer) and in these cases where you do want the extra power from this amplifier, please design your own PCB with thicker tracks to handle the power better and give better sound due to lower track resistance. I designed my own board and it works very well. Even though more components are involved, the design can be almost as small as a board for the TDA2040 (and like) devices. All resistors are recommend to be 1% metal film, recommended for the accuracy of their values. Capacitors should be electrolytic with values of 1uF or greater, although you can use tantalum capacitors - I would not recommend this though as the only benefit they bring are that they are smaller, mini-elects are available from my supplier anyway and they are barely bigger and much cheaper! All electrolytics should be rated at 35V minimum and must be connected the right way round! Please Note: The 47uF electrolytic capacitor should be rated at a minimum of 63V as it lies between the positive and negative supply rails. With +/-25V supply, that's over 50V flowing through that capacitor and if it is a 35V type then it will fail! Other capacitors that are less then 1uF are polyester types and can be connected either way round. There isn't too much to worry about with the components, but do make sure you get the right values with the right voltage handling capabilities otherwise injury can occur. Also note: The datasheet recommends that R4 is changed from 82 ohms to 47 ohms and R5 is changed from 150 ohms to 82 ohms if you plan to use 4 ohms speaker loads. Otherwise for 8 ohm loads, leave them as the recommended values. I don't recommend you use 16 ohm loads. A critical part of the construction is that the TDA1514 chip must be put in the board the correct way round! The diagram shows the device viewed from the front (i.e. not the mounting base side)! Pins are 1 to 9 in order from left to right, don't get this wrong. Also, of course, it is critical that you get a damn good heatsink! These devices do warm up quite a bit when pushed hard, without a heatsink, they would overheat almost immediately - bit like an AMD athlon computer processor! The chip must also be isolated from the heatsink using mica washers otherwise the -V tab will short with the heatsink which in most applications is likely to be grounded. I have been kindly submitted PCB layouts from a reader named MC Mike. He has made drawings of his own layout and mine on PCB software and has allowed me to host them here for the benefit of others. The above is my design, the bottom is the one I followed your design from your website, choose one try resizing by printing. The parts I followed exactly from the Datasheet. Parts for your design, is exactly like your original. These designs above are likely to help out those who can make boards with more specialised equipment and may also be clearer for the humble etch resist pen user like me. Both should work fine and my version (2nd of the two) is certain to work, but smaller than MC's which is probably the better choice. I must add I have not had the time to double check these layouts yet so no guarantees are made, but they look more than likely to work fine. This layout is my oringal, done by my own hard work and is also free to use if you so wish. I know that it works fine, but I make no claims that the design is ideal and I am also not responsible should it not work. The image should be printed to a size of 12cm by 7.1cm. It is unlikely that the image below will come out at a 1:1 scale. The image below is also framed at half its original size. Click here to view its full-size. Usage of the PCB layouts is not critical. But do make sure you take the necessary pre-cautions. Make sure all capacitors go in the right way round and also the amplifier chip. Make sure that the tracks you draw on the board are accurate and as wide as they can be without getting too near other tracks (as this could cause a short circuit when the board is etched). Note that the first two layouts are mono. Repeat on the left of the image for stereo My original layour is for stereo - using two TDA1514 chips. The right amplifier is simply a copy of the left. The left amplifier also labels the pins 1 and 9 of the TDA1514 chip, make sure that these are correct and the right is exactly the same way wound. 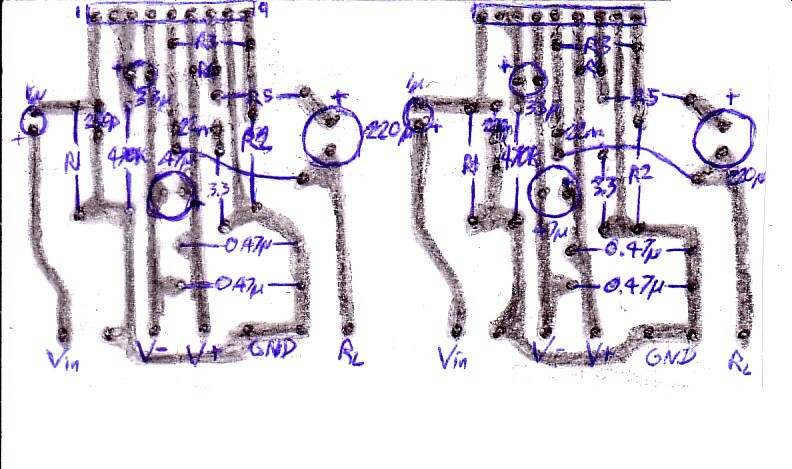 The image of my finished amp is below shows an illustration of this. I use two of these amps in my surround sound system. They are my main amplifiers for the front channel and do a very good job at driving my Moduant Short MS20i Pearls :-) The power is in the region of 30 to 40W but it does open up very nicely and is capable of party volumes (although this is thanks to the high sensitivity of my speakers also). Above is the picture of the two TDA1514A devices on my home made PCB all wired up and working well. The TDA2040 operates the other three channels, rear right, rear left and the centre. Sound from this system is very good indeed, more capable with movies then music, but still gives an enjoyable experience and it will be my main hi-fi system for some time to come I imagine. A fine collection of great TDA amplifiers. This amp will also suit many other purposes, I will leave you to use your imagination, but I do recommend it for its simplicity, cost and superb performance. I don't think many single chip amplifiers will rival it for cost and sound, though the LM1875 and the TDA2050 could be its main contenders. I've not yet tried these chips but will put up details if I do. I also add that the TDA1514 has been signed for use with compact disk digital audio. For one amp, 80VA transformer should be sufficient, meaning if you have two amps, 120VA is the recommended, 80VA will drive two, but power is likely to be affected. Capacitors should be 4,700uF or bigger, rated at 35V - I went OTT and went for 10,000uF but felt I wanted the best output power and capacitors twice as large discharge slower giving better peak power potential. Feel free to increase the capacitance but you may not get much additional benefit for the price involved. Do make sure they are connected the right way round too or they will cause injury. A fuse should be installed, I will leave it to you to work out what's appropriate because of the world-wide mains variations. The fuse must be a time delay (slow blow) variant if using toriodal transformers. Also be sure to correctly earth the supply and any metal casing around it. The components on the earth and ground connections form a loop breaker. This is recommended construction because it can eliminate those evil earth loops. R1 is a 5W or better wirewound resistor. The 100nF capacitor must be rated for 250V AC, you cannot use a 250V DC cap as it would fail if there ever was a fault causing mains to flow to earth. Check your country's rules and regulations before constructing this as it may be illegal. If so, omit all these components and connect the earth to ground but never disconnect the earth lead... it could save your life or somebody elses! That covers most of the design, but please remember to read the datasheet (linked above).